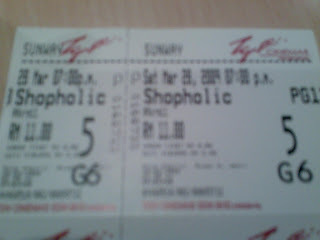 I can only say one word to describe the Shopaholic movie---AWESOME!! 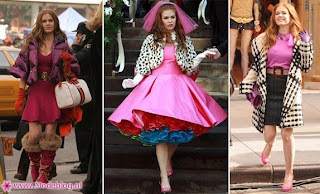 !There was funny parts,sad parts,god-awful embarrassing part( FOCUS on the fan dance!! )but mostly there were a LOT of laughter when I watched it with Izza on Saturday.The movie was very colourful too because of Becky ways’ of wearing more than one color at one time.I read in the article in The Star yesterday about the stylist for the movie,Patricia Field,and she told that a lot of the stuff was bought in Japan and a lot of it was vintage mixed with designer items. Her first outfit when she went for the Allete/Successful Saving interview consists of a blue dress layered with a purple shirt inside with a purple/pink belt, orange gloves (I think),coral briefcase & yellow/green handbag..I LOVE IT!!!..hahaha. Because of the movie, I can’t wait to buy more big belts to cinch my entire wardrobe .Becky wears belt for ALL of her outfit and some looked brand new and some looked vintage. Even the author of the books,Sophie Kinsella(or her real name Madeleine Wickham) went out and bought a lot of belts while watching the filming of the movie,according to an interview with her which was featured in The Star yesterday,All in all, although the movie didn’t follow the flow of the book, in the opinion of a true blue fan of the Shopaholic series,it did the book justice. While watching the movie,my mum called me a few times so of course I couldn’t answer the phone as the cinema was filled with people, so I texted her instead.She said that the family,including my brother who’s back from Johor(he studies there) are going to sleep at my grandma’s house. So after the movie,went to Izza’s place to get my stuff(oh yeah,when we were at Sunway,it was the Earth Hour & of course,Sunway Pyramid was all 'terang benderang'..LOL)and then we headed back to my house to which Izza chatted away with my mum while she gossiped about her neighbours..ahahahah.So much for us studying for the t.literature test which was during yesterday’s morning.Yes,we had a 3-hour test on freaking SUNDAY morning!! The bungalow was filled with people,my 5 family members,my grandma,my 2 aunts,me & Izza.My aunt even ordered pizza hut for all of us at like,11.30 at night(being the Domino’s fan that I am,didn’t know that Pizza Hut has expanded their delivery to 24 hours).Oh,btw..what’s the deal with Nokia Music Express 5800? ?Lots of my family members are buying it. My younger brother just bought it. My aunt has it and so does my cousin,Kak Hani. Oh,I sooo want to watch this movie!! !It'll only be out in September though..But I've shown the trailer to my friends & they love it!! lots of pink there:) wanna see it! oh yes! love the movie.